I was SO glad I had time today to play with the Wednesday Sketch Challenge over at Split Coast Stampers. Today's sketch looked simple enough. 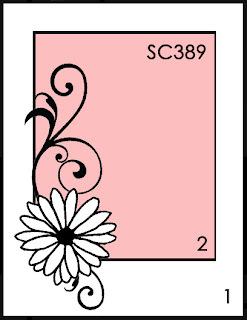 I still had the Blooming with Kindness stamp set sitting out and I thought the flower would be fun to use on the card. First I stamped it in VersaMark and then used gold embossing powder. YUCK! Then I stamped the image with VersaMark and used white embossing powder. YUCK! once again. And then I stamped the image with VersaMark and used black embossing powder. I'm not overly thrilled with it but it's not as gross looking as the gold and white were! I wanted to use embossing powder because I was going to use the watercolor crayons but changed my mind and used chalks and some Smooch Spray. I think the Smooch Spray acts like a fixative because the chalk feels pretty set. I still have Smooch Spray on my keyboard because I didn't bother to use the special box or protect my keyboard. That stuff doesn't come off very easy! Anyway, now the flower has not only some soft color but a bit of pearly shine to it too! I did flip the sketch. I didn't like this flower at the bottom. It somehow looked much better at the top. I guess I just like to be different. I added some green leaves from the punch with the Bird Builder punch. The words are from the Field Flowers set. And the decorative paper is from the Subtles Pack. There's not a whole lot to this card. It was very fun to do and very simple too! If you have time I do highly recommend you give the sketch a try. 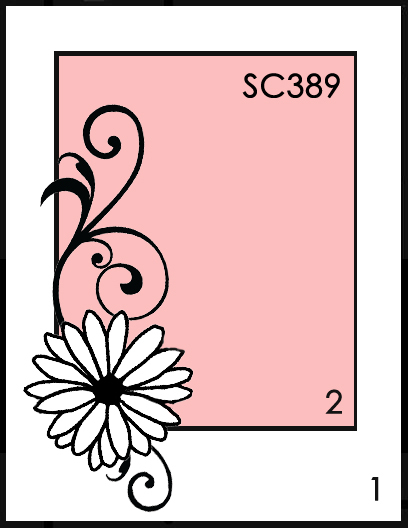 You don't need to post it at Split Coast Stampers but it is fun to do!